It’s time to celebrate. “Let’s Celebrate” the Grange that is. A full weekend of events are scheduled for June 11 and 12 at Cheshire Grange Hall. 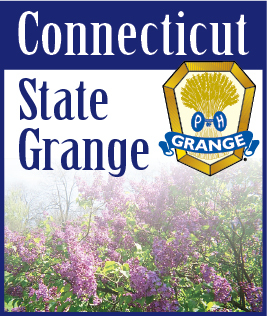 Photo Contest entries have to be to me by June 11 at 10:00 a.m. You can bring them to Cheshire Grange hall that morning between 9:00 and 10:00 a.m., or mail them to me ahead of time. If it is easier for you, you can bring them to the State office in Glastonbury by June 8th and I will make a trip to Glastonbury to get them. **New this year, we will be sending a best in show entry to Oklahoma in November for a National Judging. Some of the National rules will be different than ours, so if you want your photo to be considered for the National contest please keep the following in mind: Minimum size 4x6 inches; Maximum size 11x14 inches. These sizes include a backing or matting. No frame is allowed, but all photos must have some type of ridged backing. First prize at National is $100; 2nd is $75; and, 3rd prize is $50. “The National Grange Lecturer/Program Director retains the right to disqualify any photo that depicts a scene or image that is contrary to the Organizations core values with the approval of the National Master.” It’s not too late to get an entry ready. Good Luck to all! On Sunday, June 12, a full day of events will be held starting with Chaplain Amy Whitcomb’s Church Service at 11:00 a.m. This will be followed by a lasagna dinner put on by the Youth Committee. At 1:00 p.m. we will start judging the Talent and “A Number” contests. Our Talent winner will go on to the Northeast Region Judging which will be held as part of the North East Grange Lecturers Conference to be held in August in Bridgewater, Massachusetts. By the time you read this, information on the conference will be in the hands of all Lecturers. It will also have been sent to others who attended last year. If you haven’t received yours yet, please let me know and I will get another copy out to you right away. See you in Cheshire on June 11 & 12.